I’ve seen this cake many times, all over the Internet. Each time, I doubted my ability to make it look as good as it did in the picture. And so this gorgeous cake sat in the back of my mental “to bake” list for months. I’m not sure what finally pushed me to go ahead and try baking a zebra cake, but I suspect it had something to do with needing something gorgeous to photograph with my amazing new camera. Turns out, I’m thrilled that I finally made this. Yeah, it was delicious. Yeah, it totally wowed everyone who saw it, but there’s something else. This cake was totally easy to make. You’ll have to just believe me, until you actually try it. It does take an extra couple of minutes, but they’re minutes well spent. 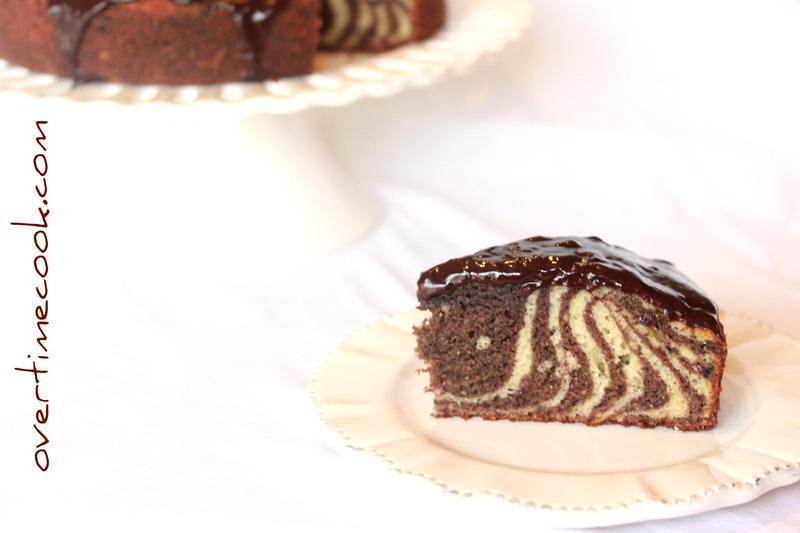 If you ever want to impress someone by baking a super impressive cake, go ahead and make a zebra cake. Preheat oven to 350. Cut a 9 inch circle of parchment paper and line the bottom of a 9 inch round baking pan, then spray the bottom and sides well with baking spray (with flour). Set aside. In the bowl of an electric mixer, beat together the eggs and sugar until creamy. Add the milk, oil and extracts and stir to combine. In a separate bowl, whisk together the flour, baking powder and salt. Slowly stir the flour mixture into the wet ingredients, stir until just combined. Pour two cups of the batter into a bowl and set aside. Add the cocoa powder to the remaining batter in the mixer and stir until fully incorporated. Place three tablespoons of the white batter in the center of the prepared cake pan. Place three tablespoons of chocolate batter in the center of the white batter. The chocolate batter will push the white batter out. Repeat with the white, then the chocolate until you have finished all of the batter. You should see rings of white and chocolate batter in the pan. Bake at 350 for 40-45 minutes, or until a toothpick inserted in the cake comes out clean. Leave cake in the pan to cool for a few minutes before placing on a wire rack to cool completely. Important notes: Try to keep the batter as centered as possible as you work with it, because you can’t smooth the top of the cake out afterward. Also, try not to drip as you pour the batter in, as the drips will show up in the finished product. For the optional glaze: Heat the cream in a small saucepan, bring it to a boil. When the cream is boiling, turn the flame down and add the chocolate chips and vanilla extract. Stir until mixture is smooth. Set aside to cool slightly before glazing the cake. *Note: I substituted Rich’s Whip (Cool Whip) for both the milk in the cake and the cream in the glaze, and it worked wonderfully. Thanks for coming, hope you enjoy! yours looks better than when i made it, mine the layers kind of got smudged together. it did taste good though. Looks beautiful but I don’t understand what you mean by ‘cut line the bottom of 9 inch parchment paper’. Should the bottom be lined with parchment and then that parchment should be sprayed and floured? Is the parchment necessary? Sorry about that Lesley! I fixed it in the recipe. You should use parchment paper, because you don’t want to risk having your cake stick. And you should spray it- again, to be safe. Great! Thanks for clearing it up. Looking forward to making it this week. Mmmmm…. looks delicious. I am definitely going to give this one a try. I am not a great baker – but cakes, pies and sweet breads are good for me to handle…. cookies or pastry… well….. I just do not have the patience anymore – so I love these kinds of recipes! Thank you for all of your hard work and sharing it with all of us! This turned out gorgeous! And I bet it tasted great too. Looks fabulous! I saw this cake a few months ago and have felt a bit daunted about trying it as well…but I may have to give it a go! I’ve been tempted by these photos, too! Maybe I will take your lead and give it a shot, too!!! Yours is absolutely perfect! What a fun delicious looking cake! I’m always so impressed by folks who can bake such pretty desserts! HI Miriam, It’s Huvi Prupas(Lebovic) here. I just checked out your website for the first time and I think it’s absolutely amazing!Everything really looks so great. 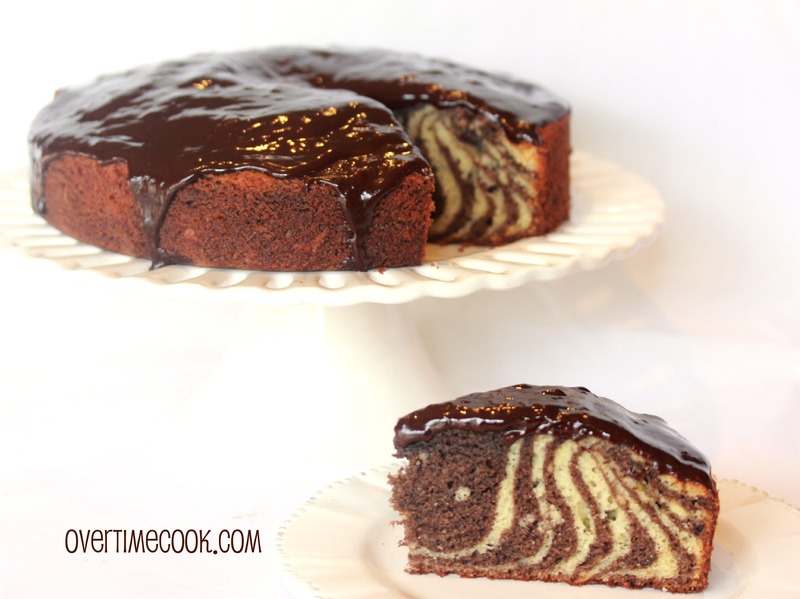 I just made the zebra cake, I was so excited to try it! It came out really well. I’m looking forward to presenting it to my guests on shabbos. Keep up this great project, I love it! I made this cake (with the only change of using coffee lightener instead of whip for the cake batter. It was beautiful – though a bit labor intensive. Wow, the zebra effect looks stunning! I haven’t tried the full recipe yet but I did use the glaze recipe for sprinkle cupcakes and it was PERFECT. I’ve made this cake twice – love it! The first time I used Rich’s Whip in the cake, the second time soy milk. It came out even better the second time! 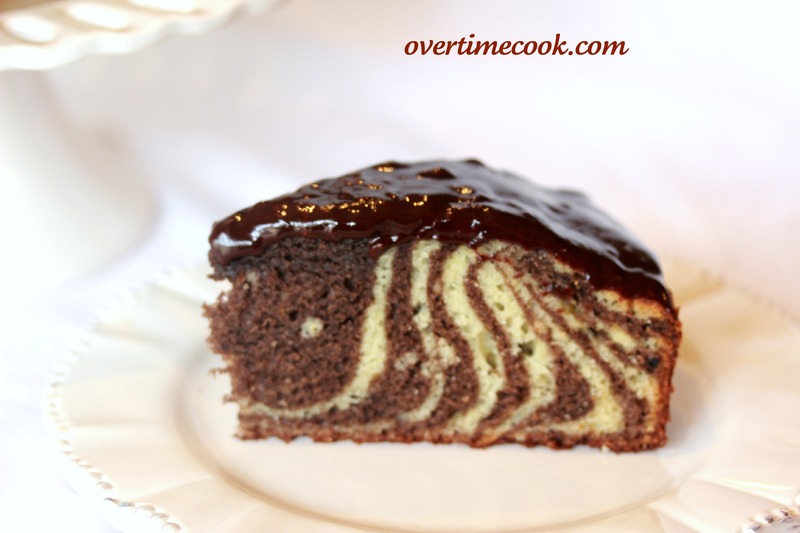 zebra cake is one of my favorites and this is the best zebra cake recipes ive tasted! Thx! Mine is in the oven… and the batter was delish at any rate :). Any tips on how to spoon it without dripping? Do you use a cookie scoop, or something? would I double for a 9×13 pan? How can this cake be mmade pareve? I’ve made zebra cake before, using a different recipe, but wasn’t happy with the taste so decided to try this one. Topped it with a basic chocolate ganache and flavor was DELICIOUS but unfortunately the chocolate all sank to the bottom because the cocoa made it too heavy. This didn’t happen with other recipes I tried. The chocolate meaning the chocolate batter not the ganache. I didn’t get the proper zebra effect.